In his mid-twenties, Dave Asprey was a successful Silicon Valley multimillionaire. He also weighed 300 pounds, despite the fact that he was doing what doctors recommended: eating 1,800 calories a day and working out 90 minutes a day, six times a week. When his excess fat started causing brain fog and food cravings sapped his energy and willpower, Asprey turned to the same hacking techniques that made his fortune to hack his own biology, investing more than $300,000 and fifteen years to uncover what was hindering his energy, performance, appearance, and happiness. From private brain EEG facilities to remote monasteries in Tibet, through radioactive brain scans, blood chemistry work, nervous system testing, and more, he explored traditional and alternative technologies to reach his physical and mental prime. The result? 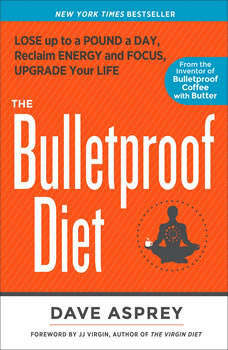 The Bulletproof Diet, an anti-inflammatory program for hunger-free, rapid weight loss, and peak performance. The Bulletproof Diet will change what you think you know about weight loss and wellness. You will skip breakfast, stop counting calories, eat a high-fat diet, work out and sleep less, and handle stress with ease. By ditching traditional diet thinking, Asprey has maintained a 100-pound weight loss, increased his IQ, and reached a level of health that seemed unattainable. His forties are truly better than his twenties, and The Bulletproof Diet brings his best hacks to the masses.